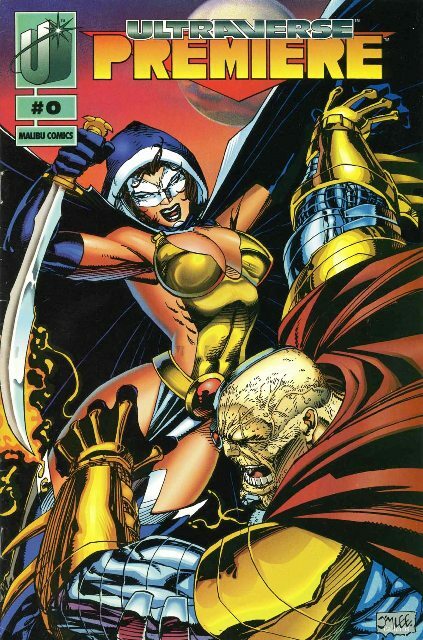 Ultraverse Premiere #0 (remember the zero issues?) is a book that was forged in the fires of early 1990s comics gimmickry. It also went hand-in-hand with the early days of the Ultraverse, and the only way to get this book was to send in five coupons cut (or copied) from Prime #1, Hardcase #1, Strangers #1, Wizard Magazine #23, and Malibu Sun #26; you could also pick up a “wild coupon” from Freex #1 and Mantra #1 if for some reason you couldn’t find one from the other books. Once you had all the coupons you would mail them away and a couple of months later you’d get a comic in the mail. Nice! This book featured a collection of short stories for all of the early Ultraverse books and also had a cover by superstar artist Jim Lee. It’s a nice-looking book, kind of hard to obtain and plenty of talented artists and writers were attached. Don’t get me wrong, this is a cool book to own and a nice piece of Ultraverse memorabilia. But even though it seems like it should be rare, eBay has been clogged with this issue for years. At any given time there are 10-15 listed, often for a buck or two. The only recent sales since October were for $1.45 and $2.04. Mycomicshop.com has one listed for $1.10. Mile High Comics has a NM copy for $7.70, although you could probably knock a few bucks off that with one of their codeword sales. But why bother? This is a book you can find on the cheap pretty much anywhere you look and for a lot less effort than it took to clip and mail in all those coupons back in 1993.